Sometimes things just can't be fixed. I’m still sorting through the old Apple stuff my friend Keith donated to me when he was clearing space in his attic, and one of the things in that little collection was a Performa 5200, the big, lovely, chunky, beautifully proportioned all-in-one Macs that prefigured the iMac G3. The other day I cleared a space on my desk, plugged it in, and switched it on. Or rather, I flicked the switch to turn it on, but nothing happened. Had it showed a blinking question mark on screen, I’d have known what to do: install an OS, or perhaps replace the hard disk. Had it booted with the wrong time, I’d have replaced the CMOS battery. Had it even shown a sad Mac, I could have begun to troubleshoot based on the error code it showed. But no; nothing. Truth be told, it’s not in terribly good shape, cosmetically. There’s a crack in the case at the top, the front panel is a bit loose, there’s a peeling sticker at the top right, there are a few scuffs and scrapes, and of course the plastic has yellowed pretty extensively over the two decades of its existence. I sit back and look at it, and I think: I can’t be bothered trying to get you working again. It’s going to take hours, it’s going to create mess and dust, it’s probably going to cost me money in replacement parts, and ultimately, at the end of the process, even if I get you working again, you’re still going to be a bit of a dinged-up, grody example of this particular form factor. I’m being a sentimental old silly, but I feel terrible about this. And maybe—no, definitely—I’m being a sentimental old silly, but I feel terrible about this. I look at this computer—a computer that isn’t especially notable or worthy of attention—and I think I’m letting it down. It’s hung on for 20 years, and has doubtless enabled an astonishing variety of things during its working life. I think about how much of it probably still functions perfectly. I think about how beside myself with excitement I’d have been as a teenager if I’d been given this machine, and about everything we’d have done together. 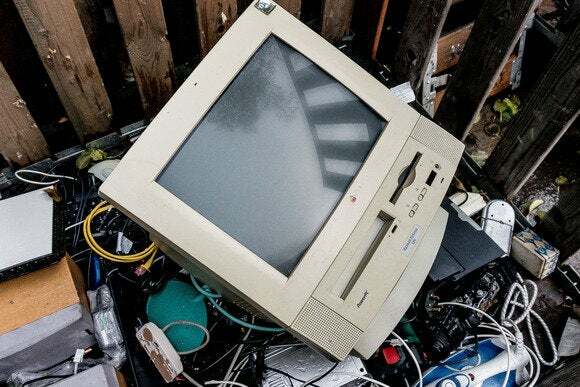 I think about how if I just junk it, there will be one fewer Performa 5200 in the world, and even though this one doesn’t work, the idea of lowering it into a crate at the recycling center and walking away while it mutely stares up at the sky just makes me a bit sad. I am aware I’m anthropomorphizing hard here, and that this collection of plastics and silicates no more cares about what happens to it than would the overwhelming majority of the population of Earth, but that doesn’t make the experience any less true for me. A couple of years ago, when driving between my and my wife’s family at Christmas, I crashed our car, and though I slid off the road on black ice at a comparatively low speed, the car was sufficiently damaged to be a write-off. We loved this car; it was our first, and we were proud of having paid for it. Just before it was due to be collected to be scrapped, I had to pop out to the driveway to read the mileage for our insurers. I climbed into the driver’s seat via the passenger door, and turned the key in the ignition; the engine sprang to life and the dash lit up as usual. In fact, if I turned my head a little so that the mangled metal and bin-liner-covered windows were out of sight, the car looked perfectly normal and functional. I felt the same mix of emotions then as I do now with this dead Mac, both at first glance completely fine, but both destined for landfill because they’re beyond economical repair. And I know where this feeling comes from. My poor mammalian brain, struggling to process a world filled with things it is woefully underevolved to deal with, is shorting out, triggering the same feelings of loss and impotence as you get when you look down at the body of a bird which has flown into a window and died. I am not suggesting for a moment that with the “death” of a Mac we’ve lost as valuable and precious a thing as when a sparrow, a beloved beagle, even a friend has died, but when I look at this Performa—or, from the right angle, my old car before it was towed away—and see something that looks fine but lacks that vital spark, there’s an unsettling and peculiar echo of that sense of loss. I know this all reads a bit overblown, a bit like an over-eager freshman essay on loss which makes the mistake of thinking that for something to be worth writing about there has to at least be an analogy you can draw that hooks into the big themes of literature. It nevertheless feels true to me, and knowing, as I finish writing this, that my next task is to bundle the Performa 5200 into my new car and drive to the recycling center to take the photo you see at the top of this page, well, that just makes me a little melancholic and introspective. Obsolete Macs seem important to me, in part because they were once so wonderful and because I wanted them so badly, and in part, since I once wanted them so badly, because I feel an odd, nebulous sense of duty about keeping them working and useful. It’s hard for me to say goodbye to one, even—perhaps especially—one as undistinguished and tatty as this. Nobody likes the idea of being consigned to the scrap heap when they become unsound and irrelevant, and it turns out I don’t like the idea any better when it’s just an obsolete bit of technology.